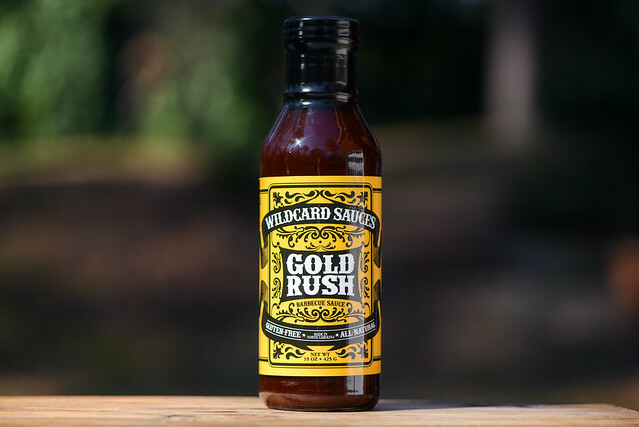 Treading familiar sweet and spicy territory, but with flavor components that make it wholly unique, Wildcard Sauces Gold Rush stands out as an excellent all-purpose barbecue sauce choice among a crowded field. What do you do when your corporate gig finally breaks you? For brothers Ryan and Kyle Fraser, the answer was to drop it all and hit the road to gather intel on what makes great barbecue sauces. With research under their belts and a good idea of the flavors that span a wide range of preferences, the two went to creating their series of Wildcard Sauces from their home base in Raleigh, NC. Their line-up of six different sauces and one rub demonstrates this understanding of the spectrum of tastes, with sauces ranging from mild to extra hot to mustard to even Mexican mole-like. Their sauces can currently be found in select stores around North Carolina and few in Virginia and South Carolina, as well as online. The initial aroma of this sauce is sweet and smoky with a character that seems best described as "chocolaty." There's a strong sweet tomato smell that's mixed substantially with Worcestershire. There's a mellow earthy background note, and very slight garlic and onion components, all which combine to create a very unique aroma. This sauce is dark maroon, with a purplish tint to it. It's semi-glossy and mostly smooth, with a very slight texture. It's also opaque, making it hard to see any spices. The sauce sits right in the middle of the thickness scale and falls in a fast, uneven pour from a suspended spoon. That stream of sauce quickly switches to fast drips, then slows with the last three or four drips taking their time to release. Once the sauce stops falling, there's a medium coating left clinging to the silverware. The initial taste of this sauce has a deep tomato flavor combined with a hearty amount of Worcestershire that creates a complex flavor right out of the gate. A sweet honey undertone brings the sugar next, with a taste of ancho that adds its unique fruity and almost chocolaty quality. As the sauce settles on the tongue, vinegar works its way in, starting with mellow tang that quickly becomes more and more tart. A mild smokiness and earthiness then makes an entrance, adding in a medium heat as the sauce leaves the tongue. This has the aftertaste being a mix of spicy, tangy, and earthy with a lingering mellow sweetness and fruity tomato. This sauce coated the chicken in an even, medium layer that baked down well over indirect heat and picked up nice caramelization over direct heat, with no burn off. Just about all the flavors out of the jar remained, giving the leg a very robust profile. The flavor was a balanced mixed of smoky, earthy, spicy, and sweet, with that ancho/chocolaty taste remaining, lending its very unique stamp. While some of the caramelization may have looked overly blackened, there was no burnt flavor whatsoever. The lineup of Wildcard Sauces had impressed me in the past, and continued that trend here with Gold Rush. All of their sauces bring a pleasing barbecue flavor, but have such a unique stamp and thoughtful combination of flavors that they stand out amongst a crowded field. 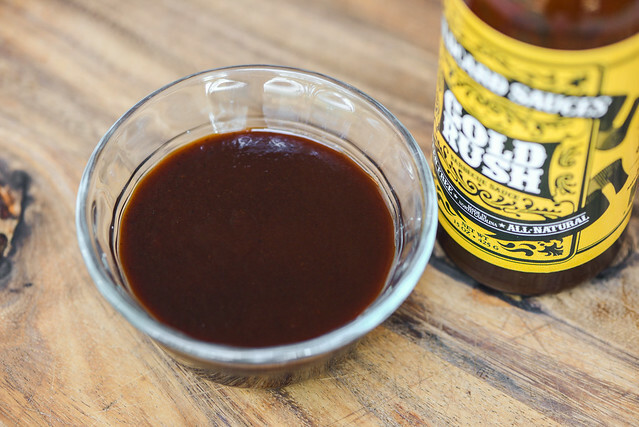 Straight from the bottle, you may expect Gold Rush to be the standard sweet and spicy barbecue sauce, and while it can be described as both, there's so much more complexity here. Mainly the use of ancho paste delivers a smoky, fruity, and chocolaty flavor like none other, while chipotles provide both a smokiness and pleasant heat. 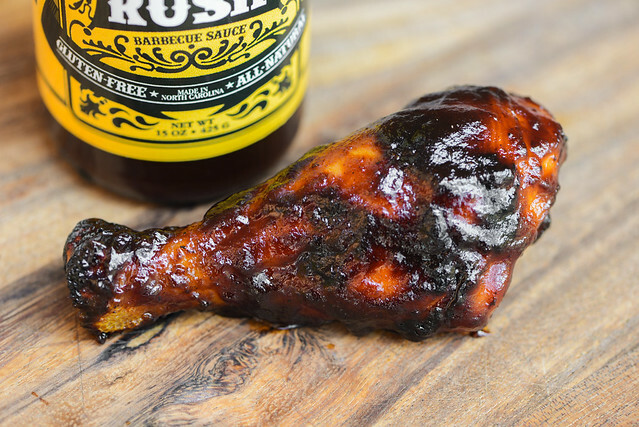 All of these came together to make one tasty chicken leg, and i's robust, but not overly bold, flavor profile is perfect for just about any application—seafood, ribs, steak, burgers, etc.